Super quick scheduled post for you today – just so you don’t forget that I’m technically a ‘style blogger’! This is an outfit from a couple of weeks before I left for holiday. It was a sunny weather work day outfit. I got the dress from Debenhams that weekend I went shopping with my mum – I can’t for the life of me remember the brand of it, but I’ll check at some point! I spotted it in the sale and just had to try it on because this shape and style is my absolute favourite with the fitted sleeveless top and flared full skirt – sort of 50s shape I like to think. Anyway, I was browsing around the internet and spotted this Temperley London dress on Avenue 32 which is pretty much the exact same print, just a longer length! Considering that mine only cost me like £12.99 (can’t remember exactly but it was cheap! ), I’m pretty impressed with that 😀 And I love the low dipped back of mine too. Wow, every single item here was bought in a sale at some point in time, awesome! Anyway, I’m taking the dress away on holiday with me, so it should have been worn at least another time by this point. I’ve finished off all my packing at this point and managed to cut down the number of items I was taking by quite a bit. Well, I say that – I cut it down then added like 6 vest tops that I’d just ordered on ASOS especially for the trip, so that’s okay, right?! I realised I was severely lacking in plain coloured vest tops – I used to have a few but they’ve lost their shape and are only wearable as pyjamas now. So I ordered a few, plus a couple of bandeaus to go under some low slung tops, and I’m good to go. 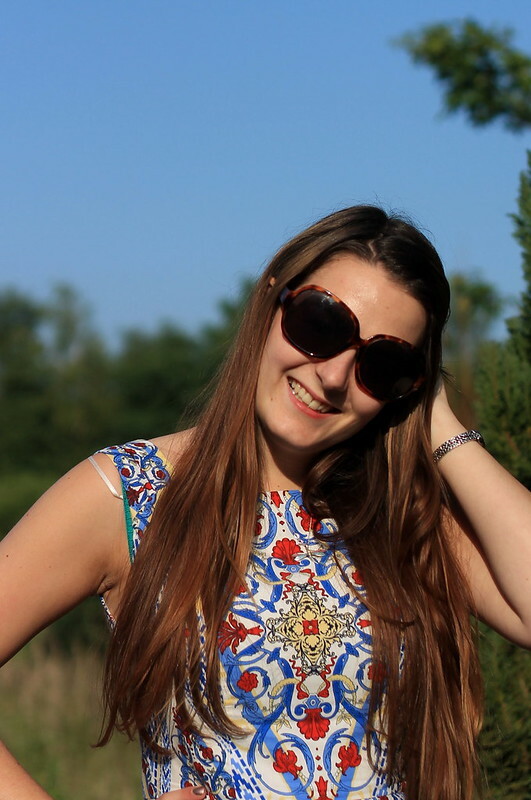 The Temperley dress you found inspired my final year collection at uni! You wouldn’t think it though if you saw it! (You can see it on my blog). Oasis had a similar one in and I wish I’d bought it, I can’t find it anymore. That dress is gorgeous! I love how the designer dress is 900 euros, at 50% off! crazzyyy. You certainly did find a great deal! Have a great holiday!